Glamorgan all-rounder Graham Wagg is set to return for the One-Day Cup match against Essex on Friday after recovering from concussion. 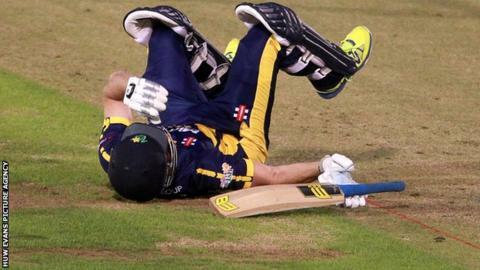 Wagg was ruled out of the win against Kent on Tuesday after suffering a "mild concussion" in the T20 Blast defeat by Gloucestershire. The 32-year-old says he is fully fit after playing a full part in training. "It's good to get back out, with a few boys bowling some bouncers at me as well. I appreciated that," said Wagg. Glamorgan started this year's One-Day Cup on minus-two points after they were deducted two points for preparing a poor pitch for a 2014 match against Durham. The Welsh county's opening match of this campaign away against Nottinghamshire was abandoned because of rain. They then claimed their first win as Chris Cooke's brilliant unbeaten 94 not out from 54 balls saw them beat Kent at the SSE Swalec Stadium. After watching the dramatic victory over Kent from the stands, Wagg is eager to return for the second of three successive home match against Essex. "It'll be really nice to come back to play in a winning team again," Wagg told BBC Wales Sport. "We're off and running, and there's a lot of good form with ball and bat."